Marines are on track to replace nearly all M4s in every infantry squad with 11,000 M27 Infantry Automatic Rifles from Heckler & Koch. Marine Corps Commandant Gen. Robert Neller said earlier this year that he wants the rifle in the hands of every “0311” rifleman in the Corps. Marines began fielding 4,000 M27 IARs in 2010 to replace the M249 squad automatic weapons, but that later shifted to also replace the M4. Currently there are three M27s in each infantry squad. 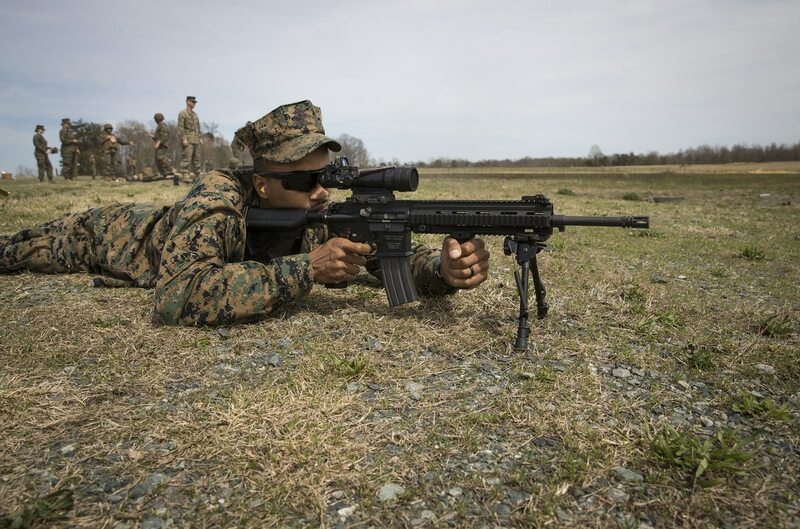 The new order will replace all M4s in every infantry squad with an M27, except for the squad leader, said said Chris Woodburn, deputy of the Maneuver Branch, Fires and Maneuver Integration at Marine Corps Combat Development Command. The change includes infantry training battalions, he said. The fully-equipped M27-toting squads won’t happen overnight, the timeline for funding is slated for fiscal years 2019 and 2020 with the ability to get some of the rifles out in fiscal year 2018, if money becomes available. The current request of 11,000 rifles does not include the Light Armored Reconnaissance or Amphibious Reconnaissance units, which also have three M27s per squad to fill the squad automatic weapon role, Woodburn said. But officials decided Marines needed both rifles, so the 5.56 mm M27 has been phased in to replace the M4, which is based on a more than half century-old M16 platform. In most respects, experts agree the M27 is a superior rifle to the M4, but it does come at an increased cost. Officials told the Marine Corps Times earlier this year that M27s cost $3,000 apiece while the M4 costs $1,000. At the time, officials said riflemen were the priority, but the weapon will next be in the hands of combat engineers and light armored reconnaissance battalion scouts. Officials had queried industry for a timeline to produce and deliver 11,000 IARs. The new pre-solicitation notice of 50,184 is to up the production capacity that H&K must be able to meet as the sole-source provider, should the Marines decide to order more in the future, Woodburn said. The M27 has a 30-round magazine and fires up to 40 rounds per minute. The IAR was first used in combat by Marines from the Hawaii-based 1st Battalion, 3rd Marines who carried it to Garmser, Afghanistan, in April 2011. The rifle fires both in semi-automatic and fully automatic via a selector switch. It also has between 100-150 meters extra range than the M4. The pre-solicitation notice opens the project to other companies but requires a sole source. The deadline for response is listed as Aug. 28. Earlier this month the Army increased production capacity request of 10,000 Interim Combat Service Rifles, chambered in 7.62 mm, to 50,000 as a temporary M4 replacement to better penetrate enemy body armor, similar to the Marines’ recent shift. Researchers at the Army’s Maneuver Center of Excellence are evaluating multiple variants of rifles and intermediate caliber combinations to ultimately replace the M4, officials said. The interim caliber would fall somewhere between the 5.56 mm and 7.62 mm carried in most Army and Marine squads. Marine officials have said they are monitoring Army testing on the intermediate caliber rifle and round combination.